Kahuzi-Biega National Park is a UNESCO World Heritage Site in the Democratic Republic of the Congo. Kahuzi-Biega National Park operated by the Institut Congolais Pour La Conservation de la Nature (ICCN) is a World Heritage Site. 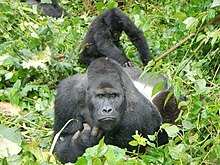 Kahuzi-Biega National Park is famous as the largest refuge of the highly endangered Eastern Lowland (Grauer's) Gorillas. The last census of the gorillas in 2013 counted only 145 individuals. The highland section with most of the gorillas is open for visits, with three gorilla groups habituated for visitation. In March 2014 in the highlands of KBNP there were no security problems. Visitors are advised to contact the rangers in advance and travel with them from the Cyangugu-Bukavu border with KBNP park rangers. The park is absolutely gorgeous and the gorilla experience is simply superb. In general the area from Bukavu to KBNP is secured by several MONUSCO posts. In summary, stay with, listen to and follow the advice of the KBNP park rangers and you should be at least as secure as you would be in many major cities around the world. The Congolese people are extremely friendly and helpful and the eastern Congo is a lush and enormous landscape of beautiful mountains and lakes – simply gorgeous! Kahuzi-Biega National Park is the last major sanctuary of Grauer's lowland gorillas. They are larger and potentially more endangered than the mountain gorillas of western Rwanda and D.R. Congo north of Lake Kivu. A visit to Kahuzi-Biega National Park is high-adventure travel to an environmental paradise! A small zoological and forest reserve was established around Mount Kahuzi in 1937. A larger Kahuzi-Biega National Park was established in 1970. The park became a World Heritage Site in 1980 to protect 200-300 eastern lowland (Grauer's) gorilla occurring mainly in the forests at 2,100-2,400 m, but also in the lower rainforest. The 'mosaic' of biotypes makes the park an excellent gorilla habitat. Other primates include eastern chimpanzee, and numerous Cercopithecinae and Colobinae. Other mammals include elephant, forest hog and many antelope and duiker. Avifauna includes the endemic Rockefeller's sunbird, Grauer's broadbill, Grauer's warbler and Shelley's crimsonwing. Endemic mammal species include giant gennet, Aquatic civet, Maclaud's horseshoe bat, Ruwenzori least otter shrew, owl-faced monkey, eastern needle-clawed galago, Thomas' tree squirrel and Alexander's bush squirrel. Fifteen villages of shifting cultivators were located in the eastern sectors of the park when it was created and continue to be occupied. The park is situated in one of the most densely populated areas of the country. Some 90% of the population of Kivu is rural, mainly dependent on agriculture. Seven separate tribal groups live around the park including the Pygmy, Barega and Bashi peoples. Traditional livelihoods are based on shifting agriculture and subsistence hunting. The park consists of two sections, the lowland (closed for visits) and the highland (open for visits). The park is situated in the eastern part of the country, 50 km west of the town of Bukavu, near Lake Kivu and the Rwandan border. It consists of a smaller sector on the eastern side covering part of the Mitumba Mountains, and a larger western sector in the Zairean central basin. The two zones are connected by a narrow corridor. The entrance to the park is at Tshivanga, on the eastern side. The lowland sector in the Zairean central basin covers the watersheds of the tributaries of the Luka and Lugulu rivers. These both drain into the River Lualaba. The extension lies below 1,500 m apart from isolated peaks such as Mount Kamani (1,700 m), and consists of mountains cut by deep valleys. Undulating terrain in the west forms a belt between the two zones. The western zone is forested by equatorial rainforest, with transition forest between 1,200 m and 1,500 m. In the eastern zone, six different primary vegetation types have been distinguished: mountain rainforest, high-altitude rainforest, swamp forest, bamboo forest, subalpine heather and swamp and peat bog. The park is accessible by a decent road from Bukavu. Taxis, buses, and car hires can be made to reach the park. You need a letter of invitation to apply for your D.R. Congo visa. Book your airline tickets to Kigali, Rwanda (KLM or similar) and to Kamembe-Cyangugu-Ruizi (Rwandair) in advance. You need a copy of your paid airline e-ticket to apply for a D.R. Congo visa, which costs US$115 for a single entry. You may not need a visa to visit Rwanda; check Rwanda#Get in. When you have your visa, let KBNP know your travel dates. Fly to Kigali Airport in Rwanda (it is the closest international airport). Do not try to cross the D.R. Congo border without someone from D.R. Congo government, hopefully from the ICCN (Institut Conglais de Conservation de Nature) who run the Kahuzi-Biega National Park (Parc National de Kahuzi-Biega). If they are with you, your crossing will be smooth and quick. A permit is required from the ICCN either at their office in Bukavu (on Ave. Lumumba; +243 99 725 4296 [English] or +243 97 130 0881 [French]; reservations@kahuzi-biega.org) or at the Tchivanga base camp. Both locations are open M-F 8AM-4PM. The following prices are for foreign nationals. Congolese along with expatriates and nationals of CEPGL, EAC and SADC member countries pay lower rates (with passport and proper residence or work visa). Travel with the ICCN park rangers or their designated tour operators at all times. While gorilla trekking may be the park's most popular attraction, visitors may also hike the parks trails to view monkeys, chimpanzees, and a wide variety of birds. The Marais Musisi Trail passes through bamboo forests & swampland culminating in a fantastic view over the Marais Musisi. The Tshibati Waterfalls Trail passes by three waterfalls and offers hikers the opportunity to take a dip in one of their plunge pools. The summit of Mount Kahuzi (3308 m) offers great views of Bukavu and Lake Kivu. The ascent takes 4 hours through bamboo forests and sub alpine vegetation. The descent is approximately 3 hours. The summit of Mount Bugulumiza (2400 m) is easily accessible via a 6 km trail from Tshivanga Visitor Centre and takes about 3 hours round-trip. The summit offers great views of Mounts Kahuzi & Biega along with the surrounding forest landscape. The summit of Mount Biega (2790 m) is a 6-hour round-trip hike from the main road. The vegetation is significantly different from that found on Mount Kahuzi. The park is currently working to clear a trail to the summit that was hoped to open back in 2013. 220-volt adapters for your USB electronic devices and laptop computers. Download the Dict-0-French application for your Android or iPhone device. A Camelbak Ultraviolet water purifcation water bottle and two simple empty Nalgene bottles to hold extra water. A Sansbug or other indoor mosquito tent/net. Mosquitos are not bad at KBNP but it is better to be ready. Mosquito repellent – wipes or small bottles for your aircraft hold luggage. Mosquito head net and brimmed rain hat – just in case. A good rain suit – This is the rainforest! The usual foreign travel medicines (Ibuprofen, anti-diarrhea, Pepto-Bismol). Just in case. A waterproof camera for the forest. All of the batteries you might need. Wet-ones or other alcohol wipes. Some LL Bean Duck Boots – 8 inches or higher. Thin sleeping bag or two blankets and two sheets. Think luxury indoor camping without the tent and stoves. The food is terrific. Make sure you try the Tilapia from Lake Kivu, and fresh avocados, bananas and citrus fruits from the local farms in the Bukavu valley. D.R. Congo has a variety of excellent beer. Try Primus, Mutzig, Turbo King. There are no hotels in the park, so if you want to stay in a hotel, consider the nearby city of Bukavu. A designated campsite is available beside the park. There is cell phone coverage at KBNP. Purchase a Vodacom SIM card in Bukavu on your way in. There is also electricity and narrow satellite Internet at Kahuzi-Biega National Park during working hours. You should take malaria pills, starting at least two days before leaving for Rwanda and D.R. Congo (consult with a doctor). There are also recommended shots for these countries; consult with a tropical disease specialist or your doctor. Visit Idjwi Island, located in Lake Kivu, for its pineapple plantations, birds, or simply for a walking tour to spot monkeys and meet the locals. The (Lwiro Primate Rehabilitation Centre) is near the park headquarters. It cares for orphaned chimpanzees and monkeys and provides educational activities for locals and tourists alike. This park travel guide to Kahuzi-Biéga National Park is an outline and needs more content. It has a template, but there is not enough information present. Please plunge forward and help it grow! This travel guide page was last edited at 11:52, on 13 May 2018 by Wikivoyage user Traveler100bot. Based on work by Wikivoyage users Mx. Granger, Ibaman, Ground Zero, WOSlinker, Wrh2Bot, Virunga, Andrewssi2 and Ikan Kekek, Wikivoyage anonymous user 41.202.241.1 and others.